Eunectes deschauenseei Dunn and Conant, 1936, Holotype: ANSP 20891. Type Locality: Probably Marajo Island at the mouth of the Amazon. Distribution and Habitat. The species inhabits swamps and seasonally flooded habitats in the Brazialian states of Amapa and Para, including the mouth of the Amazon and the Ilha de Marajo. It also occurs in French Guiana and possibly in Suriname. Females are known to reach 3 m, males are slightly smaller, reaching 1.9 m. This species appears to be the sister to E. notaeus. 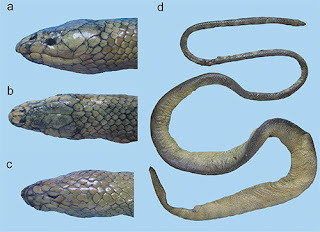 Starace (1998) reported mammals, birds and fish in the diet of this snake.